Documenting my evolution into a crazy cat-less spinster. Digital tuners are AWESOME! So much easier than the pitch pipe I used for my guitar in the 80s. It put me a hair over $100 for the Uke, the teach myself book and the tuner, but oh so worth it. I'm thinking about buying myself a ukulele for my birthday. After all the fuss I made about turning 40, it's a bit weird how quickly the year went. I think a uke would be fun and I like most of the stuff I'm hearing on the web. But I'm also trying to cut back on the spending, especially on frivolous, under-utilized stuff. Tonight I was thinking about my paper clock kit. I really wanted this paper clock kit I saw in Signals catalog about fifteen years ago. I asked for it for Christmas, and because it wasn't that expensive I expected to get it. My mom always liked buying me interesting things. When I didn't get it I asked her about it. She said she decided not to get it because I would never make it. This made me angry. How dare she judge me like that. I was so pissed I bought it for myself. It had a huge instruction booklet (~70 pages) and sits in almost mint condition in my closet. Sometimes I think I should just get rid of it, because of all the crap feelings it brings up, but I still think I'll put it together some day. Anyways, I think I want a ukulele, but will it sit gathering dust like my mom's piano and my old guitar? Probably. Will that cause pain and guilt like the paper clock? Decent starter ukes are about $55 bucks on Amazon. Add a tuner and a instruction song book and it's still under $100. I've wasted much more that that before. I wonder if a local store would have a used one. Actually, any used string instrument in a music store would most likely be way out of my range. I think NtF made me a video for my birthday. I'm kind of excited about that. Is there a bar in this skum bucket town? For years I've had the ghost of a chorus from a Jermaine Jackson song about rain drifting around in my head. I remembered that I liked it. I remembered it had something about falling rain in the chorus. I remembered liking the song, but not nearly enough to buy the album. (Yes, this was early college and vinyl was my favorite format.) What I did not remember was this totally 80s extravaganza. Over six minutes of West Side Story plot with crazy costumes, big hair, white leather and white motorcycles. The song is "When the Rain Begins to Fall." I can finally stop trying to figure out what that song was. I still think the chorus is catchy. Maybe in another 19 years I'll listen to this song again. If you find the setup as painful as I did, skip to 2:33, that where the chorus starts. Oh, did I mention it's a duet with Pia Zadora? Now I remember why I’m not a sports fan. It’s heart-breaking. I didn’t see the good bits. I didn’t get home from my meeting until the second quarter. So I missed the opening touchdown, but got to watch the Colts score again and again. I stopped watching at half-time and then watched most of the fourth quarter. I know the basics of the game and hardly ever watch, but even I could see the Colts were tight in both offense and defense while the Bears couldn’t pull it together. I imagine my brother-in-law walked away from the TV before the game ended. I haven’t talked to sis yet, but I’ve seen him turn off the game in disgust before. The commercials I saw were lame even for regular spots. I watched Flower Drum Song during half-time, third quarter and post game. I kept clicking back to catch Criminal Minds, but finally set my VCR to catch it. I know all the songs from Flower Drum Song by heart. I listened to my mom’s record of the film soundtrack for years. It was nice to finally see the story behind it. It was also nice to see the Asian characters played by Asian actors, not at all common in 1961. I knew some of the actors were Japanese not Chinese, but it’s still better than Yul Brynner or Katherine Hepburn. During the dance number in Love Look Away the dancer performed a series of athletic gymnastic stunts instead of a fluid dance. I find this boring and it reminded me of the extended ballets in Gene Kelly movies. It turns out Gene Kelly was the choreographer. I once heard that the difference between Kelly and Astaire was the Kelly made dancing look difficult and Astaire made it look effortless. I much prefer effortless dancing. I know it’s difficult, I don’t need to see the effort involved. I love musicals, but I am bored by most ballads and ballet numbers. I would like to get Flower Drum Song on CD. I’d forgotten all about Don’t Marry Me. What a fun song. It was weird to see Det. Sgt. Nick Yemana singing it though. I'll stick with Netflixing; it is much more satisfying than being a Bears fan. Did I think through the repercussions of MiBloNaGaMo? Nope. I neglected to define what Navel Gazing is. I know it when I read it, but I'm not sure how to avoid it. For example, is this whole paragraph navel gazing? I think so. Damn. Favorite Song - Another Travelin' Song - I think I found Bright Eyes via Wil Wheaton's blog, but I'm not sure. Favorite Album - Telling Stories - Hearing First Try made me want to listen to the whole album. General - At 28 seconds long, I'm Not Wearing Underwear Today is a hoot. I put it on a CD I burned for Sasha and her kids. They adore it. I forgot I had it, so it made me giggle this morning. I'm not sure if Marisa will be posting her Random Friday Music list today. When she does she usually posts of list of others too. Marisa is participating in NaBloPoMo, so I look forward to reading a post a day from her this month. Also, I've never had so many visitors before. Melissa over at Buzz Off posted Bugboy's sushi costume and I've had more visitors in the last two days than in the last ouple months. Welcome all! I did not work on Bugboy's costume at all this week. With one thing or the other I just didn't get to it all week. I know I can get it done, it's mainly the drying time for the paint. I can't just flip from front to back, I have to wait for each coat to dry. The glow-in-the-dark top coat is really thick. Thank goodness I talked him out of the attaching head feature. Favorite song - Trouble - This song reminded me why I bought the album after seeing them (him?) open for Average White Band at House of Blues. Favorite Album - Beautiful Girls Soundtrack - This isn't my favorite song on the album, but anytime I hear a song from it my brain perks up because I love the movie and the soundtrack. General - I like the Mood Indigo part better than Sophisticated Lady, otherwise this song would be up for favorite today. Up until the second Etheridge song it was a great set. They all fit into my mood and the cold rainy weather. Then it fell apart. Seen Live - Papa Chubby and Natalie Merchant. Does seeing Natalie Merchant at a private concert (company event) count as seeing 10,000 Maniacs? I guess technically not. She was awesome. She said she hadn't performed for an audience for a while and was kind of shy. General - Very odd to have two Glenn Miller songs in one list. I enjoyed them. Today is the day the Inge glass ornaments come out at the jewelry store. I'll be taking an early lunch to head over there. I have a list of nine people to buy gifts for. My friends are just too prolific, not going to add any new families to my list. I was excited to be the first one in my cell at work this morning, not I think the other regulars are working from home today. Ah well, I know I was here early. That counts. Favorite Tune: Wow, very tough call. I was all set to go with a sentimental favorite, but I have to say I really grooved to Back in Baby's Arms this morning. Patsy Cline rocks, but I tend to get burned out on Crazy. Nice to hear something fresh. Favorite Album: Too. Many. Choices. I know my library is heavy on the 80s but this is on the silly side. Today I'm going with The Housemartins London 0 Hull 4. This takes me directly to my freshman dorm room. I bought a lot of vinyl that year at the Record Swap on Green St.
General: I really liked Goin' Down too, I like Mickey Monkees songs. Today is my sister’s due date. No news. I’m not allowed to call her and ask how she is. It makes her very cranky. Every time my phone rings I jump. Chances are, she’ll go into labor at night and I won’t hear about it until morning. I take sleeping pills for my insomnia and it wouldn’t be very safe for me to drive over there until morning. So dad will come over in his PJs and call me later. Bugboy has announced his Halloween costume plan. He’ll be a headless skeleton. The skull is to be over-sized and double as his trick-or-treat bag. I am also instructed to make the skull so that he can attach it to the neck and remove it at will. The body should be pretty simple. 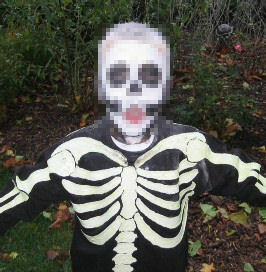 He was a skeleton in 2004. I painted with white and glow-in-the-dark fabric paint on a black sweat suit and gloves. He loved it except for the makeup. He had trouble getting it off. Now he has to be able to get the costume on himself at school. The headless part should be pretty simple; there are a lot of examples on the web. The removable, sturdy, hollow, over sized skull is more of a challenge. I asked how likely it was he would change his mind. Sis said he’s been planning this for months. We did some preliminary sketches to make sure we are on the same page. I’ll document the progress on CB. It should be easier than the sushi. General – I thought I had unchecked all my holiday music. Surprised to hear Let it Snow today. And two Billy Joel songs? That’s just weird. That’s one reason Random Fridays are so much fun, surprises. Muskrat Ramble sounds exactly like all the music they play in Portillo’s Hot Dogs, so I have trouble appreciating the song. Favorite Song – Turn of the Century – I forget how much I like Pete Yorn. I tend to burn myself out on his albums by listening to them on repeat for days when I get them. Every time he shows up in a random shuffle I want to go listen to all his albums. Then I forget to do it. He has probably released some new stuff by now. I’ll add that to my list of music I want to buy but forget about the moment I step into a store. Favorite Album – Grease Soundtrack – Seriously, did you expect a different choice? I'm anxious about bringing my iPod along to California tomorrow. I've checked Southwest site and followed all the links to security documentation. I called the 800 number just now and was told I nothing had changed about electronics and I could absolutely bring my iPod on the plane and use it. So I plan to bring it, but the thought that some power-tripping security contractor could force me to throw it away gives me a headache. Quite a mix today. I included number eleven because I like this song and I saw them live at House of Blues a few years ago. Favorite Tune - Blue Eyes Crying in the Rain - Willie Nelson - Love this song. I changed my mind several times as the list unfolded. No shortage of favorites today. General - Another Postcard always makes me smile. I saw BNL live at a New Years Eve concert. They were very entertaining. The crowd was mostly young and earnestly hip. I was with Kari and her husband and would have enjoyed it much more if my mom hadn't been in the hospital (post mastectomy) and if I wasn't coming down with what turned out to be an awful cold. I'm off to California for Serena's wedding. Wish me and my ipod luck.